Which competitor do you want to be? The special services you need to be competitive, with an uncommon style and attention from Able Swordplay or "ASP”, providing you the perfect blend of sound business practices, traditional values of quality, and creativity. 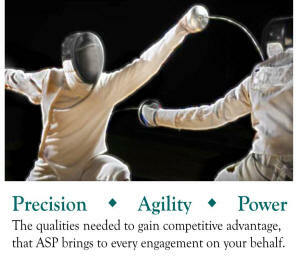 The common services you need to be competitive, with an uncommon style and attention from Able Swordplay or "ASP”, providing you the perfect blend of sound business practices, traditional values of quality, and creativity. Implement PM best practices based on the Project Management Institute and PM Body of Knowledge (ANSI Standard BSR/PMI 99-001-2013), US Defense Acquisition Standards for Project Management, framed in the DOD Directive 5000.01, and numerous GAO Reports. Have your plans and documents reviewed for compliance to GAO and/or DoD standards for Project Management in all 10 knowledge areas. Choose fixed price or hourly rates. Portfolio visualization complements Financial Reporting. Select and tailor proven visualization techniques of Key Performance Metrics to inform business executives of relative value and interdependencies. Understand why managing Task Order contract has its own unique set of challenges above standard contract administration. Give your IDIQ managers the advantage for IDIQ setup and handling of task orders with a team of performers and subcontractors. Assess the business risks at each of these three levels, which can turn opportunity into either profits and return work, or loss. You can’t manage what you don’t know. A Project Management Audit reveals a single project’s compliance to PMI/ANSI standards. Supports company certification of ISO 9001:2008 Quality management. Deliver to your clients this same project management expertise and experience through your contracts as a subcontractor. Assignments can be for a few hours to several weeks in duration. Many businesses and government agencies employ Lean Six Sigma as an enterprise resource. Bundle a Process Improvement Assessment with your Service offering to build your long-term client relationship. Nobody knows your business better than you, but large proposals or multiple simultaneous proposals benefit from experienced support. It’s not what you intend to write, it’s what the customer reads, that wins contracts. A proprietary method that compares the structure of your customer’s document to your proposal drafts makes your points the way the customer expect to read them. Have you ever teamed with a company then wish you hadn’t. A proper review of reality from marketing hype makes sure you know your team’s real capacity, strengths, and experience. Every proposal is written to win – a few are written to execute. The contract and procedure commitments made in the proposal can hit the new PM cold. Sometimes there’s no recorded reason or rationale for commitments made in the proposal. After submission, the Proposal Implementation Plan links the proposal to the project initiation and planning on award six or nine months later. Your PM will appreciate it, your customer will be impressed, and your business will avoid time and cost of re-creating what was meant in the proposal. New project managers (at any level of experience) benefit from guidance on the sequence of the many tasks of project initiation. “Do I need a communications plan? when do I do risk assessment? where do I put my project documents?” The Framework for Project Initiation is the tailored and sequenced to-do list for a new project. This is an investment in getting the project organized for a smooth start. For companies with Microsoft Dynamics AX as their ERP, the Project Management and Accounting module has many activities and tasks performed by the PM – from recording the WBS to assigning workers on projects to constructing composite rates. Not for the faint of heart to do this solo. Certified Microsoft specialist in Project Management can support your new PMs as then regularly interact with the many AX screens. Consider initial coaching, then on-demand support. When it’s time to file the paperwork, bring in your attorney. Before that, an IP Assessment can tell you what project may generate intellectual property, what IP protection is available, what cost and time it will take, and how strong the protection can be for your business. Drawing from more than a decade of experience in product development, a Project IP Assessment can help put a value on the original work created in your business.